This is a very scenic beginner run thru a deep forested canyon. 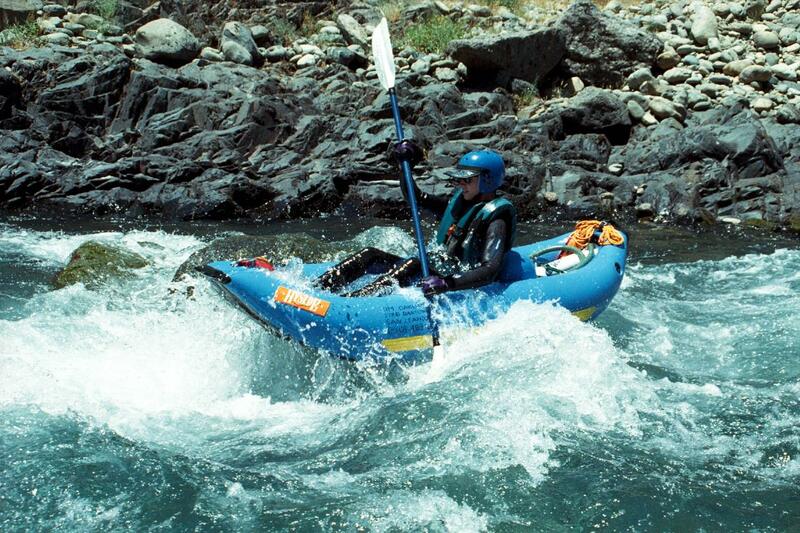 All the toughest rapids appear at the beginning and near the halfway point, so be prepared. 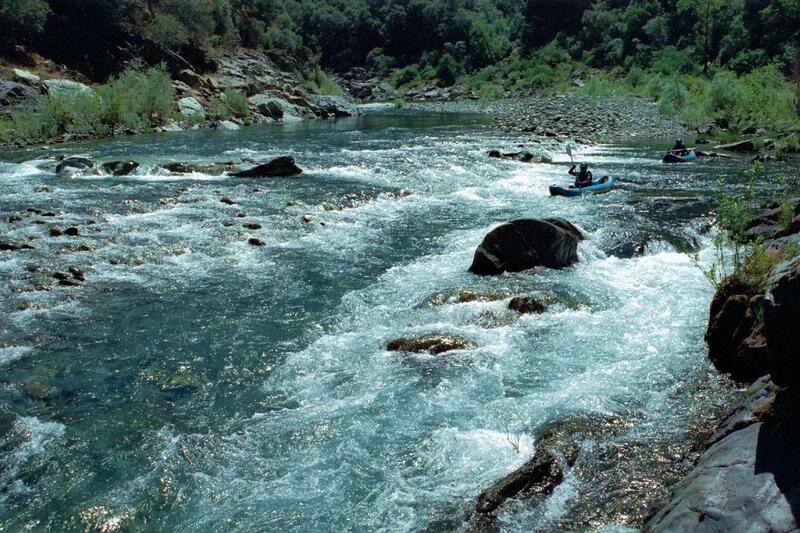 If you do this run in conjunction with the Bear River, make sure to do the Bear first, so you have some practice under your belt. 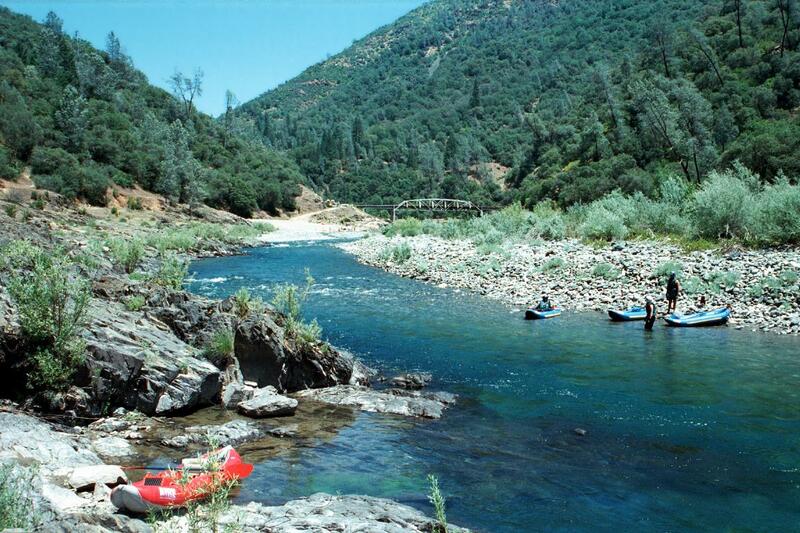 Superb wilderness camping is available below the halfway point, if you are willing to carry overnight gear. Be sure to jump on this run when the flow is right, because snowmelt gives out at some point in early summer. 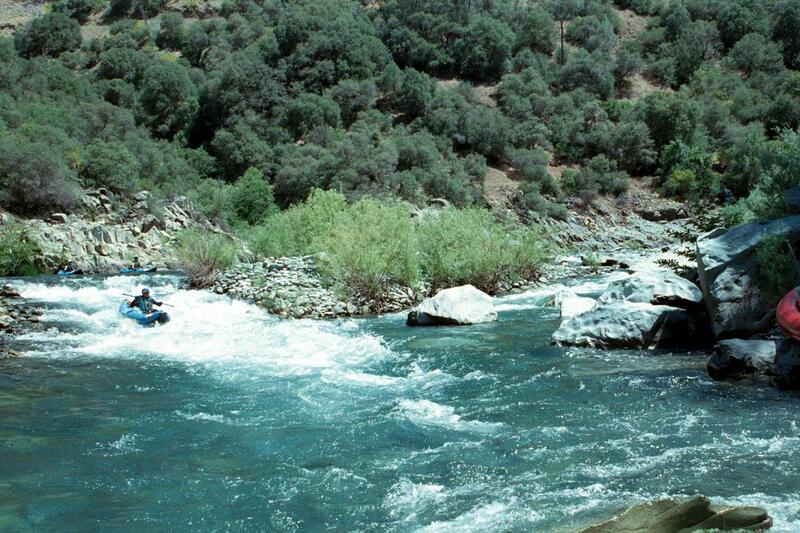 At lower flows the water has a beautiful green color, but progress can be slow, and below 400 cfs you might need to drag your boat thru some shallow rapids. 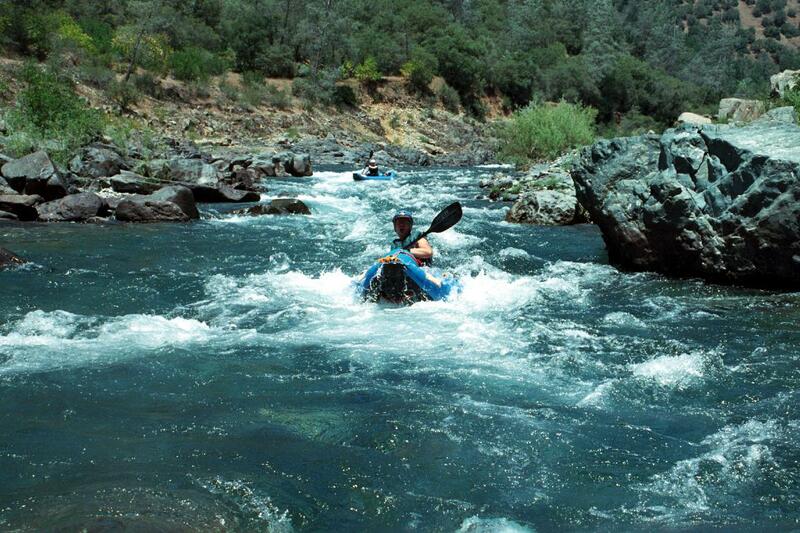 Unfortunately the Upper Clementine take-out is closed for the winter (thru April), so in that case you either have to take out at Ponderosa Way, or paddle 2.5 miles across a reservoir to the Lower Clementine access. It takes less time to run the shuttle over Foresthill bridge and float Ponderosa to Lower Clementine, than it does to drive down Ponderosa Way. Personally I would not do this trip when Clementine access is closed. All access points require fee payment, but a season pass is available. 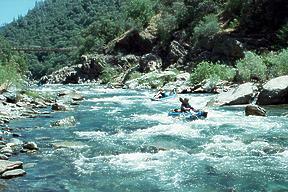 Upstream is the Chamberlain Falls run, a popular raft and kayak trip that sometimes finishes at Yankee Jim Road bridge, your put-in. Usually commercial rafters continue down to Ponderosa Way bridge, because they have dedicated shuttle drivers who are paid for the painful drive down rutted, unmaintained Ponderosa Way. 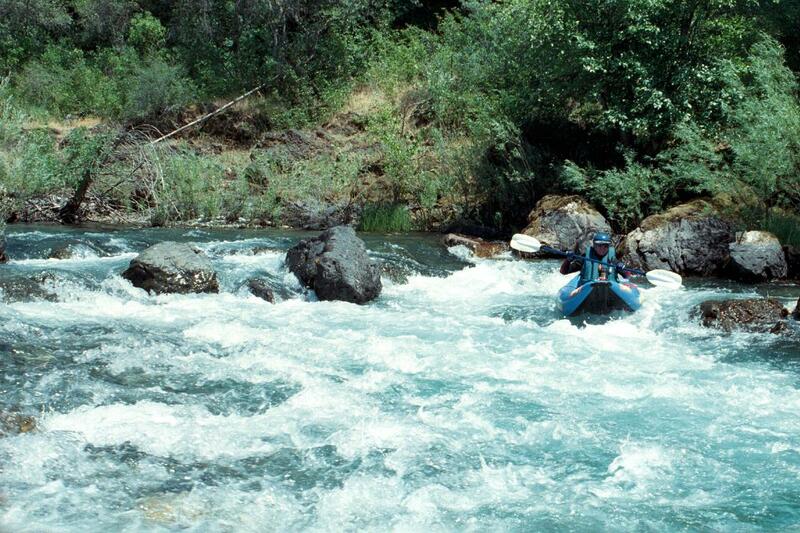 The Chamberlain run makes an excellent winter run for advanced kayakers. Put in upstream of the Yankee Jim Road bridge. A trail leads from the bridge down to the river near Shirttail Creek. The river has finished transitioning from class IV to III, but not quite yet to class II. 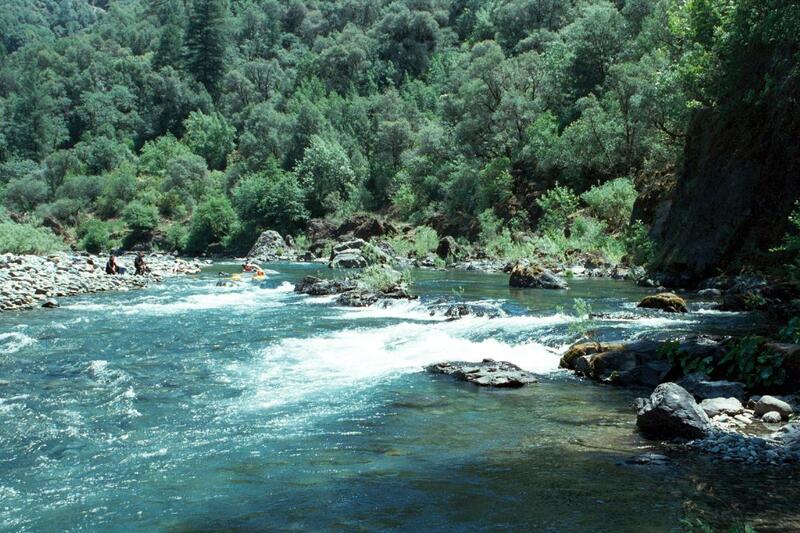 There is a fun class III- at the mouth of Shirttail Creek, just above put-in. 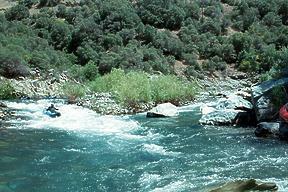 The first rapid below the bridge contains some big waves. 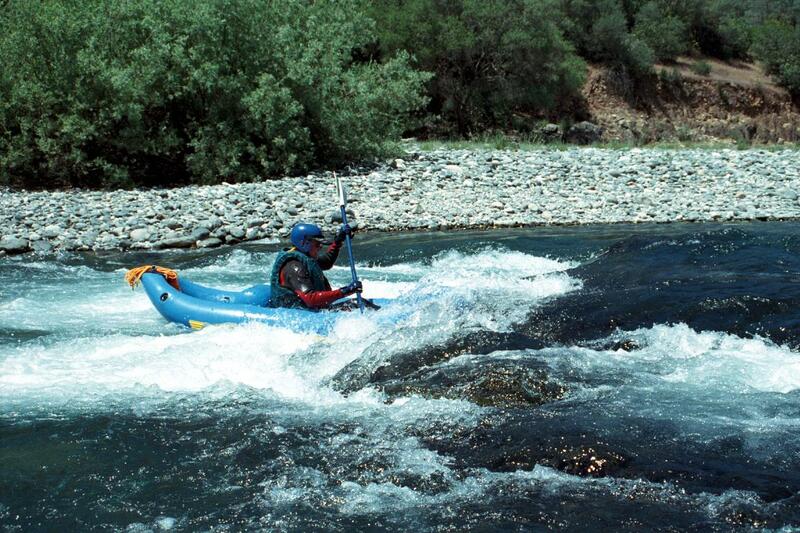 Rapid 1½ is easy, and visible in the distance of the first picture below. Rapid 2½ presents you with a left-to-right diagonal rock cluster, forcing you to choose either the left route (most turbulent) or the right (a sneak, except at low flows, when it is too shallow) as the rapid splits around the cluster. Rapid 3½ drops steeply as it splits around a brush-covered island. It is usually easiest on the right, where it verges on class III. 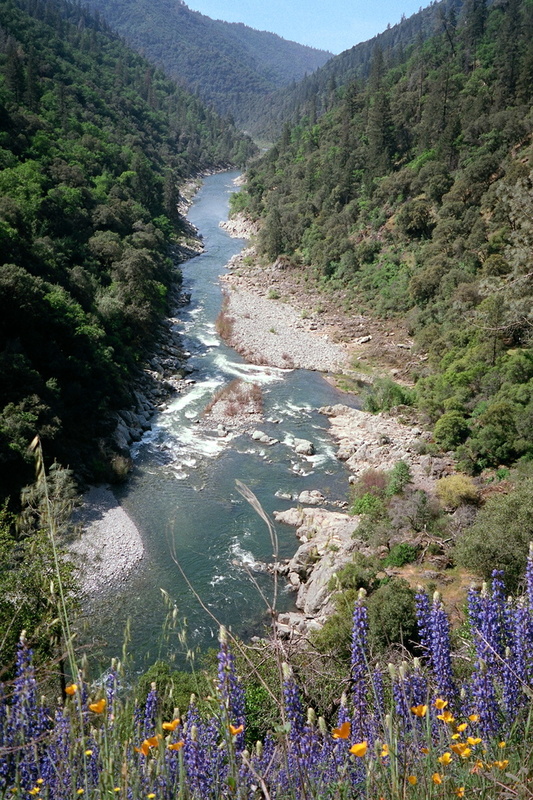 Where the river turns right into a horseshoe bend, a dirt road reaches a large boulder bar, and gold mining activity is common. 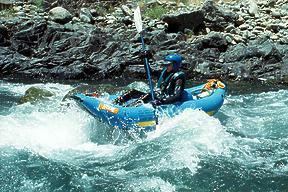 A series of rapids that becomes the hardest section at high water. The river comes out of the horseshoe bend, turns left, then back right and eventually left again, into a minigorge. 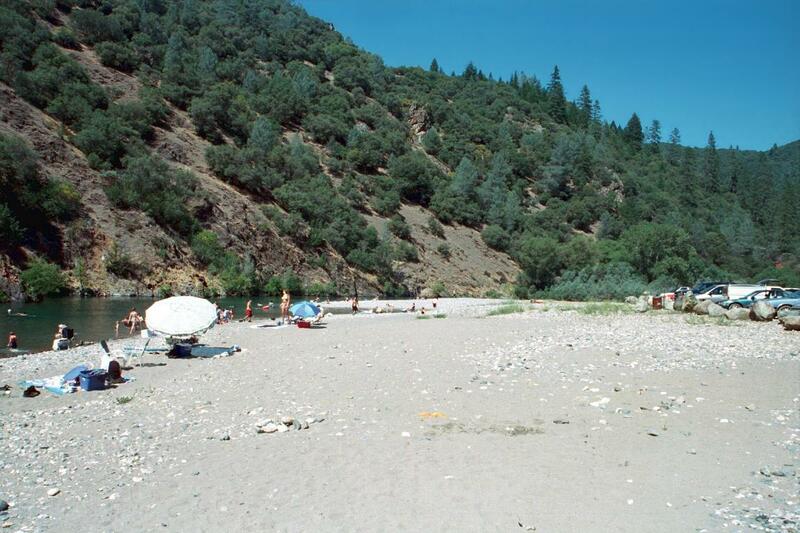 The fourth or fifth rapid, a series of standing waves with a rock hiding in the final wave, can really jolt you at medium low flows. At higher flows there is a big hole on the left at the final left turn. 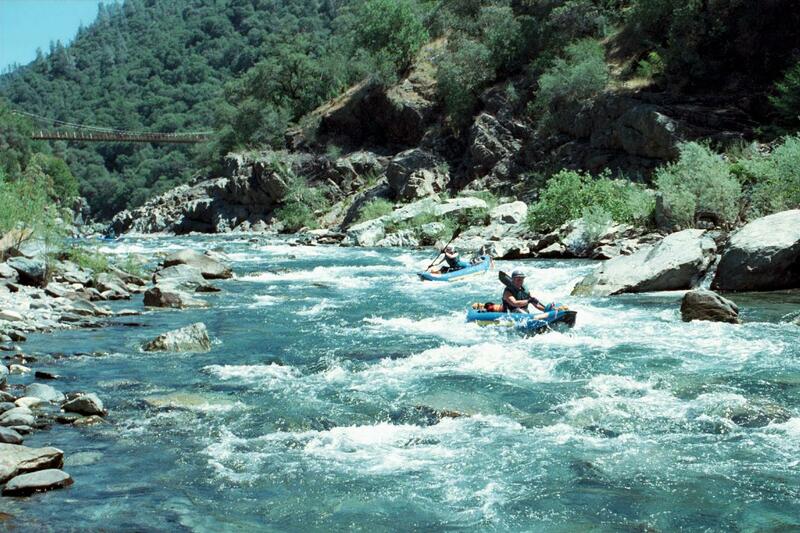 Above 2000 cfs, this is the most difficult section on this run because all the smaller rapids merge together. Ponderosa Way bridge, alternate take-out. Just downstream on the right, a trail leads to a beautiful waterfalls up a sidestream. Shortly below the bridge is a rapid with decent size surfing hole. Lunch stop below Ponderosa Way bridge Mondo surfing without crowds or queue! 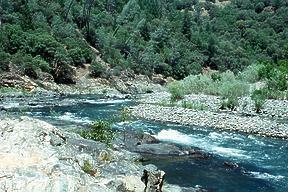 A hiking trail follows the right bank for about a mile. Shortly below there is a class II passage, most challenging on the left. Remaining rapids on the run are less than class II in difficulty. 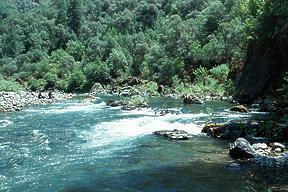 This part contains the deepest wilderness along the lower north fork: excellent scenery and solitude in a seldom-run section. In the last mile or two, you might encounter hikers from upper Clementine. Jim runs hardest part of class II passage This is the French Riviera of Auburn! The river flattens out and flatwater paddling becomes necessary. Some people consider this the principal defect of this beautiful run. Take out on the left where the dirt road reaches a large parking lot just above the top of the reservoir. No paddling on a reservoir! On warm days you will encounter scads of sunbathers and beachcombers. To reach take-out, turn east from interstate 80 onto Foresthill Road and cross the high bridge, built years ago for (hopefully now defunct) Auburn reservoir. Drive 6 miles from Auburn, past Old Auburn-Foresthill road, which descends to highway 49 and the middle fork canyon. Turn left onto a dirt road marked Upper Clementine, which descends to the head of Clementine reservoir. This gated access is open only during summertime, starting in April or May. If closed, you must take out at Ponderosa Way or Lower Clementine. The gate closes at dark, but I don't believe cars will be towed or ticketed if parked overnight. To reach put-in from there, return uphill to Foresthill Road, then return to interstate 80 in Auburn. Go north about 12 miles, take one of the Weimar exits, and drive north on Canyon Way to its intersection with Yankee Jim Road (a sign reads “Foresthill 13 miles”) where you turn right. 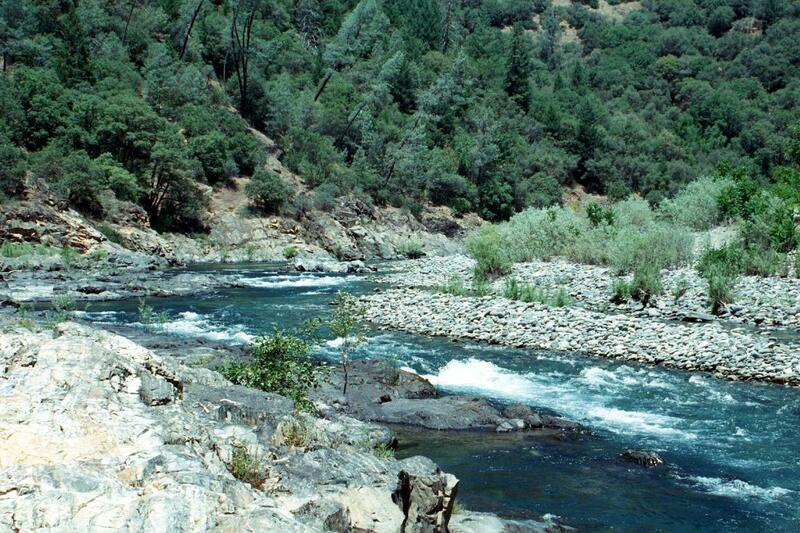 Descend steeply, soon on dirt road, to a narrow bridge across the river. It is also possible to reach the put-in by means of Spring Garden Road and Yankee Jim Road on the south side. Ponderosa Way can be reached from Canyon Way, south of the Weimar business district.